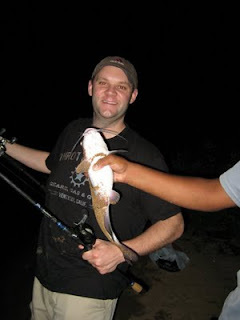 A couple of weeks ago Mary May and I decided it was about time we did some catfishing. A friend of hers from the Duke nursing school, Pauline, had been wanting to go for a while. Pauline grew up doing outdoorsy things from time to time and had a craving to give it another go after hearing Mary May speak of our adventures all semester. It was a chance for me to take her and a number of other people fishing who rarely get to go. Also joining us was Ashley (also from the Duke nursing program), Santosh (president of the Duke Fishing Team and super carp fisherman), and Chad (a good friend of mine from Duke who has been wanting to fish for a while). The Friday evening weather finally looked good, so we packed up and headed out to Jordan Lake. Jordan isn't a great place to catch big cats from shore, but it is a good place to catch a lot of them. We got to the lake and found it busy. Plenty of pleasure boaters were out and about still enjoying the last hour of light. We set up on a secondary point where I have had some luck in the past. Pauline didn't stop smiling for the first hour as she helped bait hooks and set lines, watched Santosh mix some carp balls, and just generally took it all in. Within 10 minutes of the first line being out, Pauline got a bite. 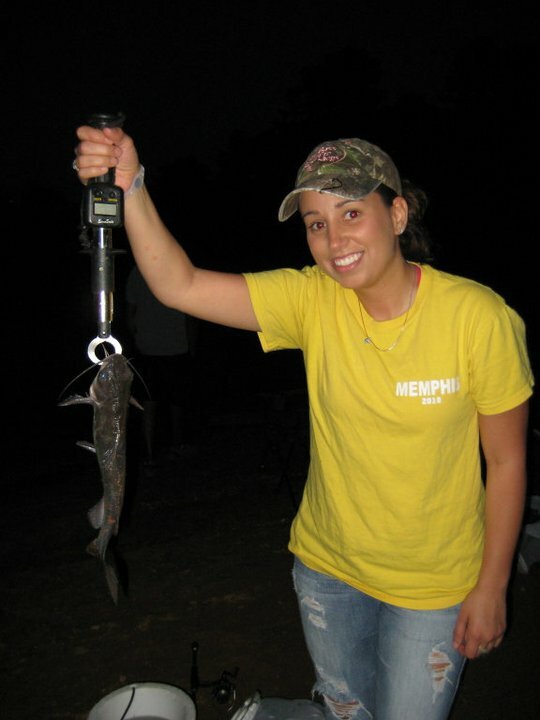 She reeled in a chunky little channel cat and was all smiles! Pauline landed the first fish of the night! Over the next hour or so the bite was slow. We picked up a couple of mudcats and small channel cats as Ashley, Mary May, and myself landed fish. Ashley also landed a bream on a big piece of liver. I think he may have been choking on it! Since it was slow, we decided to move down the bank about 100 yards to another spot. After we got there, the fishing picked up. Santosh landed a fish right off the bat and we were getting lots of bites. Then Chad got his turn. He landed a solid channel cat first and a minute later landed the biggest of the night. He admitted he never remembers catching a fish before, so I was super happy that he not only caught a couple, but also got big fish honors. Ashley got in on the fun as well! At that point, Chad decided to go out on top and headed for home, as did Pauline and Ashley. Mary May, Santosh, and I stayed a while longer and caught about 10-15 more channel cats. They weren't huge, but were great eating size. We decided to pack it in around midnight, so I filleted the fish and we headed home. It was a really fun evening and I was so glad to see everyone smiling and having a good time. If anyone out there reading this wants to fish, just give me a shout and I will do my best to make it happen - whether it be from shore, wading, or from a kayak and no matter the species. Tight lines! A good bit of filleting, but a lot of good eating! Since my weekend is being dedicated to work, I wanted to throw together a little blog. This blog doesn’t talk about big fish, but instead some other random fishy things. First, I added a disclaimers portion to the site – located on the ‘About Me’ page. It reads, "Please note that all material on this blog consists of my own personal adventures, experiences, and opinions. My reports take place exclusively on public waters using public launches unless otherwise stated. All activities documented here are within full accordance with state and federal laws to the best my knowledge." I came to the conclusion that it was an important addition to the site based on some input from others and their sites. I want people to know that the fish they see here and the stories I tell could just as easily happen to them – all you need is a little gear and a body of water! On Thursday evening I got to sneak out to a local river with my friend Eric Boyd. 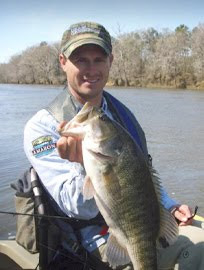 I met Eric through RiverBassin.com and the RiverBassin Tournament Trail. He won the Casual Angler Division last year in Charlotte and won the Individual and Team Divisions (with Caja Ormand) this year as well. We also both fished the stop in Atlanta a couple of weeks ago and have become better friends along the way. He happened to be in Durham for a conference, so he dropped me a line about fishing. We decided to wade for a few hours and escape our hectic weeks. We didn’t catch any big fish, but we both brought a few to hand including a solid Roanoke bass. 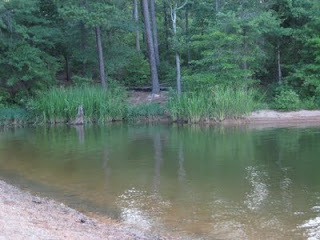 It was peaceful out there as we waded the quiet water. We saw deer (20 yards away in the river), herons, frogs, toads, turtles, and all sorts of other creatures. It was a relaxing evening to say the least and I really enjoyed the company and conversation. It certainly makes me appreciate the trips I get to make with no measuring boards, no pressure, and no fuss. Thanks Eric! Although it has been posted online for a couple of weeks, we haven’t officially announced it yet, but I am going to leak it here. 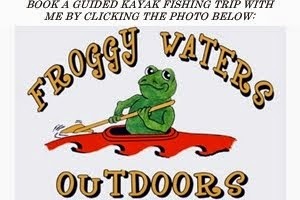 On October 15th, Froggy Waters Outdoors is hosting the First Annual Froggy Waters Outdoors Freshwater Slam. This kayak fishing tournament is going to be one of a kind! 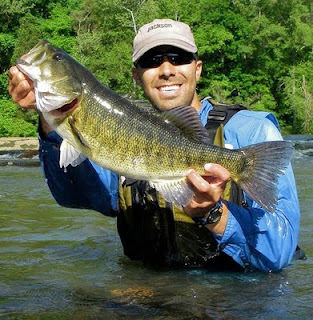 Instead of bass only, it will include the biggest total length of 3 fish one from each of the following categories: bass, catfish, and panfish. The tournament will be hosted out of Bahama, NC and anglers can fish within a 45 mile radius of the location in rivers ONLY. The tournament is a team and individual tournament and is geared toward getting kids outdoors. Teams with a youth participant receive a 3” advantage. The tournament will benefit The Schoolhouse of Wonder – a program geared to educate youth about the outdoors, conservation, and the environment. To top it all off, kayaks and canoes are being provided free of charge for anyone who needs them. The prizes are going to be awesome and are still being rounded up! We can’t wait to host this event (we will not be fishing), so please go to our site and check out all of the details (including rules, prices, etc) so far – Froggy Waters Outdoors. Also, I highly recommend everyone checking out the links on the right side of my page. There are a variety of personal sites and blogs that I like to read. Some guys tell a great story, others promote conservation, and most just flat out catch fish. Finally, every year when ICAST comes around most fish heads (like me), are foaming at the mouth to get a look at the newest gear on the market. Unfortunately, it usually comes with a lightening of the wallet as well. This year there is a ton of great new gear out. Lowrance has a sweet new depth finder-transducer system that fits into a scupper hole, new yaks are hitting the market, and a ton of companies are producing insanely light new gear. Looking at the weights on the new gear is impressive – some super light, sensitive stuff. But, all I could think about was that I have been fishing with that type of gear for the past year or so. My Carolina Custom rods are lighter, stronger, and built to my exact specifications. If you want to be blown away by a rod, call Brett and Carolina Custom Rods. He does all sorts of rods, colors, and materials. This is not a shameless plug – it is as real as the one that got away. Until next times, tight lines! Sometimes the river gives up her bounty and sometimes she takes in return. Most river fishermen, myself included, consider it the natural way of things - a somewhat karmic balance. The last time Mary May and I hit the river it was a scary experience and the river came away a littler richer that day. Yesterday we headed out searching for a few fish. I hesitate to use the word revenge, but we certainly wanted to put a few in the boat. This time, we walked away with big smiles on our faces. Like most Saturday mornings, we slept in. I know that is contrary to the beliefs of most fishermen, but after the long, stressful week we had, we needed it. We decided we would try for the late afternoon bite and fish until dark. So, we rolled out to the river and were on the water around 4 PM. I hadn't fished this stretch since December and I was excited to give it a go. Thankfully, there was a cooling breeze and the air temp. was only in the mid-80's - a refreshing break from the recent heat wave. Our Coosa's crept quietly up the slow moving river. The water was stained, which historically has not been ideal for this stretch. We began flipping worms and throwing swimbaits, with little luck. We both had a few small bites on worms, but no hook-ups. Finally, I saw a gar break the surface near my bait. The fish, roughly 30" long, was extremely dark for a gar and a gorgeous fish. I swam my bait in front of his nose and gave it a shake. He turned, nailed it, and headed for the channel. I was suprised my hook had made it through his bone hard jaw, but the razor sharp Gamakatsu did the trick. I yelled to Mary May that I hooked a gar as he pulled my kayak hard left. As he came to the surface minutes later, she mentioned that she thought I had a stick stuck on the hook as well. I assured her that it was indeed the gar's long snout - a foot of razor sharp teeth. We decided it was going to be a chore to land from the middle of the river, so I headed for a nearby rock outcrop. But about 5 feet fromt he outcrop the fish gave one last run, turned his head, and cut through my line with his teeth. So close, yet so far - the fish would have been a handful regardless, but was fun to fight. The pre-historic monster must have been camera shy! We continued on our way and still were struggling to get bites. Finally we came to a section that looked great and within minutes we both managed to lose a bass. But finally, a few casts later, Mary May landed a healthy largemouth to get rid of the skunk! I was really proud of her for getting the first fish and doing so while learning some new techniques. Then we came to a slightly faster, narrower section. I threw my worm near a downed tree, but unfortunatley had thrown it over a limb. At first, I was discouraged that I had misplaced my cast. But seconds later I felt a bite, set the hook, and knew it was a big fish. He tore through the limb and broke another small limb in half. Thankfully, with a little coaxing, the fish headed for open water. He was pulling the kayak hard and turned my boat 180 degrees. At that point he broke the water between Mary May and I and we both gasped with excitement. After a good fight I lipped him and threw my head back in relief. The fish looked to be my biggest river bass of the summer. We got to the nearest shallow area so that I could get out and get pictures. The brute was heavy with a massive head and shoulders. Before we could get the first picture I dropped the fish in the water as it shook it's head. In a panic, I jumped on the fish and for a moment had flashbacks of Gollum from 'Lord of the Rings' as I pinned the fish down. Thankfully, I wrangled it and got a few pictures. 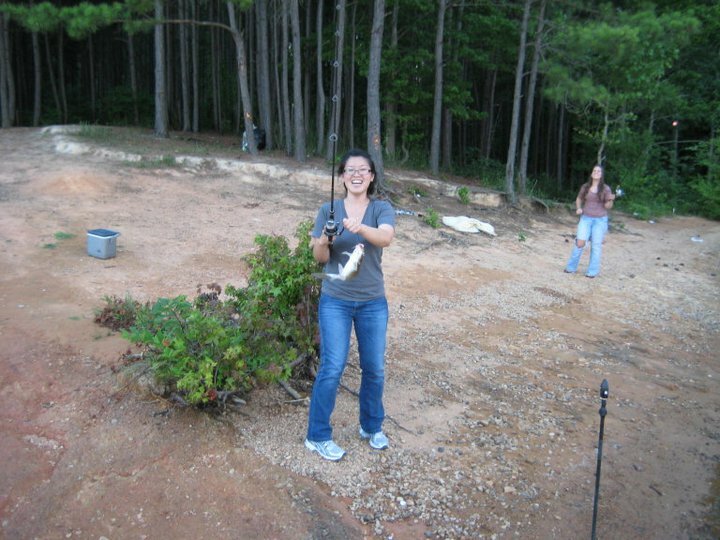 Then I somehow managed to drop it again, catch it again, and get yet a few more pictures before bidding the fish adieu. Now we were both excited and re-energized. I knew that fish may have been a signal that the bite was about to pick up...and I was right! We got to the next hole and Mary May slowly worked a plastic worm through a channel with wood cover. After a few casts to the same area she hooked another big fish that pulled her Coosa and was pulling drag too. The fish had some shoulders and had her heart racing. But with one leaping headshake, he was gone. When moments like that happen it is hard to swallow. Some people say, "Ah, that's fishing for ya", but I knew exactly how she felt and that was not was I was thinking. However, she shook it off as best she could and kept on casting. Over the next hour we caught a few more on plastic worms. We even took a break for Mary May to practice using a baitcaster. She did great with it and at that point, we wanted to give topwater baits a try - so I tied on a Storm Chug Bug for her. The Chug Bug is one of my favorite topwater baits and when used correctly, can really catch 'em. I offered Mary May some quick instruction, which she absorbed and replicated in no time. As I stood in my Coosa and was teaching her how to "walk the dog" with a Lucky Craft Gunfish I saw a nice 3-4 lb bass follow the bait in. On my next "example cast" a fish suddenly demolished the bait and I landed a chunky 15" bass. About a minute later, Mary May saw her Chug Bug get nailed, but the fish again slipped the hook. I paddled to her and gave her hooks a quick sharpening (something I was regretting having not done earlier). We paddled to the next pool and I told her how I would set-up to fish it. She agreed and started working the area. I saw a movement near some weeds about 10 feet from her bait. I suspected it was a bass chasing baitfish and sure enough - her bait got hammered about 10 seconds later. She fought and landed the fish like a champ. Chalk another smile up to the Chug Bug! At that point we realized we had lost track of time. We needed to be back by dark and it was getting dark fast. We fished a short while longer and had a number of blow-ups, but no fish. However, the Chug Bug earned it's place as Mary May's new favorite lure. We met a very friendly local at the take-out, who we talked with while he helped us carry our kayaks. Then we were on our way home to make dinner and relax. The full, or near full, moon shown as brightly as I can ever remember as we cruised the backroads of central North Carolina. All in all, we landed 9 or 10 bass with some nice fish thrown in. I think we would have seen that number double or triple if the water had been clearer, but I can't complain. We both had a great day and really enjoyed each other's company on the water. It made me wish I could do that every day. Maybe I should go buy a few lottery tickets?! When I asked fellow RippinLip Outdoors member Bill Kohls if he would join me in fishing a few RiverBassin Tournament Trail events this year he unwaivered in his response - a big yes. Although Bill had fished from non-motorized boats before, he admits that it was not often. And he will be the first to admit that he prefers the comforts of his Ranger bass boat. This past weekend marked our 3rd RiverBassin Trail event and it was our most extreme to date. In today's entry I will give everyone a recap of our weekend. Tomorrow I am going to focus on the other major part of our weekend - catching our first shoal bass. I awoke at 4 AM Friday morning. As usual, I was excited, nervous, and a little groggy as I headed downstairs. The car was loaded and ready to rock, so after grabbing a quick breakfast and mapping my route, I hit the road to pick up Bill in Winston-Salem. He was ready to roll when I pulled up and within 15 minutes we were on the road to Georgia. In typical RippinLip team fashion, we still weren't certain exactly where we wanted to fish. But, we had a list of about 5 spots to check out. Around 11 AM we pulled into a WalMart about 20 minutes from our first river stop. We got fishing licenses and some food and got back to the car. As we left the parking lot, I noticed the "Check Engine Light" had turned on. We figured it was probably a fluke given the long drive, immense heat, and smog we had driven through for a few hours. At our first stop, we arrived to find a muddy river. It wasn't chocolate milk brown, but it definitely did not coincide with our strategy of fishing plastics through the down timber that littered its banks. So off we went to stop #2, but it looked eerily similar. Stop #3 looked a little better, but a little too shallow for our liking. Then we headed further south to the Ocmulgee River. To our delight, it was clear and clean. We decided to launch the kayaks and check it out, agreeing that if we caught a couple keepers we would fish there on tournament day. Well, the keepers never really appeared, but we landed some short fish and saw a few fish in the 15"-17" range. We put the gear back on the car, started it up, and were as puzzled as ever. First, why was the darn check engine light still on and second, where were we going to fish the next day?! About 8 miles down the road we spotted an area off the road that looked awesome. It was labeled as a creek, but after inspection, it was clearly a creek arm of Lake Jackson and was off limits for the tournament. To make matters worse, when we got back in the car the "Low Tire Pressure" light was on. At the rate we were going, my dashboard was going to look like a Christmas tree by the end of our trip. Thankfully the car was acting normal and we stopped repeatedly to check the tires - only to find that each time they all looked fine. Finally, at around 5 PM, we stopped at one final destination. It was cloudy as well, but the river was much different here - covered in boulders and bedrock instead of wood cover. Within 20 minutes Bill landed a 14"-15" shoalie and I hooked and lost a monster shoal bass, which is where my tale tomorrow will begin. Let's just say, the fish convinced me to buy a hook sharpener and sharpen all my hooks that night. It was then that we decided this was our tourney day spot. And to top it off, when we got back in the car the check engine light was off. We took it as a true sign that we should fish that spot the next day! We booked it to Atlanta and got to BPS to catch the second half of the captain's meeting, get our identifiers, and chat with some of the other anglers. Knowing we had to head south for the night, we didn't stick around for the post meeting dinner. In hindsight, this was a very wise choice, because as we were getting on the highway to head south, our tire went flat. I had checked before we left Bass Pro Shops and they all looked fine, but there we were with a flat on the driver's side rear. Knowing that my spare is essentially a donut, we got into planning mode running through all the "what if?" scenarios. After all, it was 8:30 PM on a Friday night - where would be find a place open. Better yet, how were we going to get south, fish enough tomorrow to give ourselves a chance, and get back to Atlanta for weigh-in? We took turns changing the tire and making calls. Thankfully, my amazing girlfriend Mary May came through - finding the only place in that area open until 9 PM on a Friday. We called the shop and told them we were on our way. Bill and I both admitted we had never changed a tire so fast. In fact, we forgot to crank up the cable that holds the spare under the Escape, so that clanged down the road behind us for about 7 miles. We pulled up to the shop and the staff, admittedly tired and ready to go home, were nothing but helpful and kind. We helped them fix the tire and get everything back on the Escape. It turns out I had a leaky valve, which was easily replaced. The manager said we didn't owe them anything, but would appreciate it if we tipped the younger guy who had helped us out. We didn't have any cash - literally $0 - but we noticed he had a Bass Pro Shops hat on. We asked him if he fished much and he said yes. His dad and buddy both owned boats and he spends a lot of time on the water. We told him we had no money for a tip, but asked if we could give him a few lures. He said that would be awesome, so we parted with a few crankbaits and called it even. He told us it was the best tip he had ever recieved, which made us feel a lot better about the whole situation! By 9:30 PM we were on our way, again, and for the first time since 11:30 AM, my dash was clear of warning lights! We prepped our gear, sharpened some hooks, and crashed that night. We awoke at 4 AM, packed the car, and headed to the river. Upon arrival, we realized we were extremely early and regretted not getting the extra 40 minutes of sleep. But we got everything ready and came up with a plan. We decided we were going to wade all day through the rocky section of the river, but place one of the Coosas at the top of the stretch where it resembled a flatter, wood filled Piedmont flow. This meant a 1/3 mile portage, so we left anything that was extra weight behind - including the seat. Around 5:45 AM we hauled all the gear to our starting locations, put the yak in the woods, and got set up. We were casting about 10 minutes after the official start of the tournament. We went about 30 minutes without a strike and we were both a bit worried. We figured to both have limits on topwater baits because the areas we were fishing looked great. I knew the topwater bite was not going to win it for me (a sentiment Bill later shared), so I knew I needed to change tactics. Before I did, I threw my R&S Baits Chatterbuzz along an eddy seam and it was fish on! A solid 14" bass nailed the bait and would be my first fish of the day. It was a shoal bass that measured 14". My first fish of the day...and first shoal bass! Then I decided to go to my most reliable crankbait for shallow water fishing - a Lucky Craft SKT MR. Within minutes I had an 11" and 14.25" bass in hand. Shortly after I hooked up an 11.25" bass on an R&S Spinnerbait. I fished our main area hard for another hour with only a couple small bass to show for it. Bill had moved a ways down river and so I decided it was do or die time. 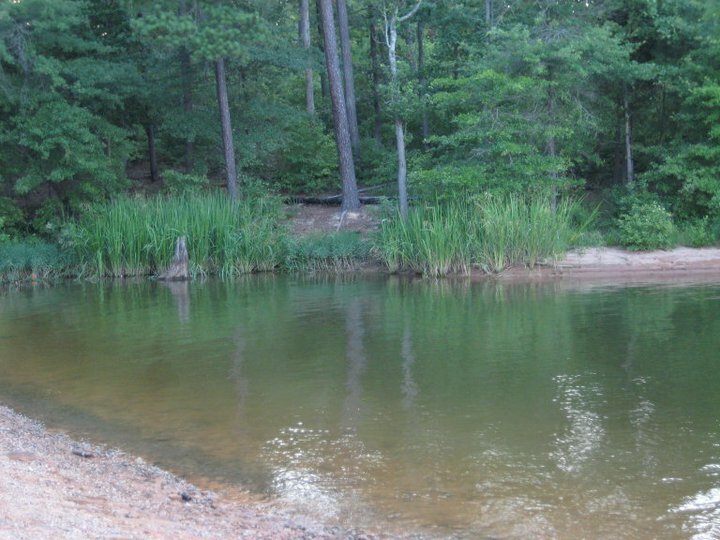 I knew that the long, flat stretch above the shoals we were fishing must be home to some big largemouths. But, I knew the climbing sun, heat, and murky water would not help my cause. Regardless, I headed to the car to grab my paddle and PFD and then to the Coosa. Armed with only the essentials, and no seat, I was on my way. I started flipping brush and logs with texas rigged worms and shakey heads, but was having no luck. Then I tried finesse worms - still no luck. Finally, I saw a rock ledge ahead. It looked like the place a nicer fish would hold. Unfortunately, after about 30 casts I had only a 11" spotted bass to show. I moved on to the next rock ledge, this one smaller, and again could manage only a small spotted bass. I was beginning to get frustrated and a little down. It was getting very hot and I knew my stringer would not hold much weight in the long run. Mentally, I started thinking about all of the people that support me in the sport, especially Mary May, and I did my best to channel their energy. Suddenly, I was thinking - "never give up, never give up". After all, it was only 10:30 AM, but man was that 106 heat index taking its toll. I spotted a small rock outcrop about 30 yards ahead. I stood in the Coosa and launched my Lucky Craft crankbait. Midway back to the boat, the bait just stopped dead. I set the hook and saw the flash of a big fish. I fought the fish standing and made my way to the rock pile to land the brute. The bass, a 19" shoalie (or shoal-spot hybrid) came to hand with the crankbait completely engulfed in its mouth. My day/luck was quickly being salvaged! I fished for the next few hours, and although I was regularly catching fish, they were all below 14". I headed back to the car to find Bill. He had a limit of about 39", but had struggled to find a pattern. Rather than fishing that stretch of river longer, we headed to another spot we had found the day before that had some similar rock ledges. After making the short drive, we hit the water. Within 10 minutes, Bill hooked a solid 14.5" bass to upgrade his limit by 4+". Not long after, I threw my spinnerbait under a tree in a side channel. No sooner did the bait hit the water, then it got nailed and I knew it was a nicer fish. It was ripping down river as fast as I could reel. As soon as I caught up to him, I lifted the 16" spotted bass to the shore and got a picture. It was a welcome upgrade to my stringer, but I knew I needed one more fish to truly compete. Although I brought a few more fish to hand, including a couple around 14", I could not upgrade my limit any more. I was crossing my fingers, but knowing how many talented anglers were on the rivers and how many were GA residents, I would need some serious luck. At weigh-in, there were all sorts of mixed emotions. A couple guys had great days and others had some of their worst days in recent memory. Drew Gregory and the crew set-up the ceremony in front of the tank at Bass Pro Shops and the awards ceremony began shortly after. First was the team division, and Bill and I were summoned to the stage as one of the top three teams. Our total of 63.75" helped us to a second place finish, missing first by only 0.5"! That helped us earn 90 points toward the "RiverBassin Team of the Year" and helps put us in the current lead with our 2nd, 1st, and 2nd place finishes in our three stops, respectively. First place was taken by Jason and Rachael Stutts with 64.25" - big congrats to the husband-wife team! Then came the individual portion. I was summoned to the stage as a top-5 angler. However, I had a weird feeling I wouldn't be up there long. Sure enough, I was right - I ended up in a tie for 4th place with 49.25". But, since my competitor's biggest bass was 19.5" and mine was only 19", I was bumped to fifth. The worst part was that my 16" spotted bass was fractions of an inch away from being 16.25". But hey, that is how tournaments go sometimes! I still walked away with a few prizes and felt pretty good about my performance. Jason Stutts ended up taking first with 52", Tim Perkins took second, and Nawtou Ly took third. Congrats to those guy for a strong showing on a brutally hot day! My finish puts me in 2nd in the individual Angler of the Year race, which will culminate in September in Roanoke Rapids, VA. Until then, there are stops in KY, AL, and WI and I suspect I may get bumped down another spot or two in the AOY standings. But, hopefully our team standing holds up to the challenge. It is going to be a fun ride for sure. Until tomorrow, tight lines!